Nicole's Needlework: My Crazy Life! See those ugly lines? Those are ladders, not pretty! My new start - so far no ladders. I did work on Raspberry Patch a little bit this week. Mostly while in the car on the way to and from the in-law's this weekend. 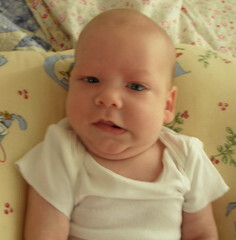 Hanging out in his Boppy. 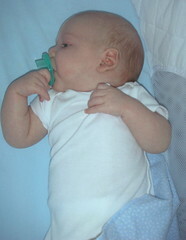 Holding on to his pacifier. Well, that's all for now. I've been pretty busy working for my brother. I'm trying to get all his accounts balanced, bills entered, and next is going through his expense receipts... fun, fun! It's coming along though. I love the work, it's just not always easy finding the time to do it. Speaking of work, I'd better stop goofing off and get some done! :) Write later! Love your sock! What pretty colors! Your stitching is definitely coming along too - beautiful! I love the colour of that sock yarn - so pretty! Nice progress on Raspberry Patch too. Whew! I am tired from just reading that! 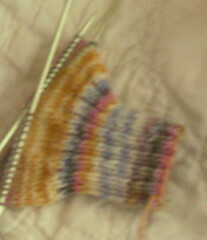 The sock is so pretty, I am obsessed with learning how to knit socks. The sock and your Raspberry Patch look wonderful!